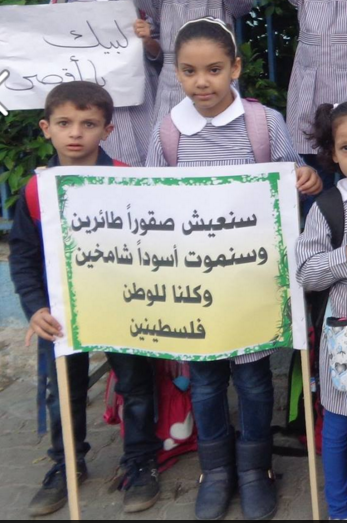 On October 20, as Israelis were being stabbed and run over daily by Palestinians, the UNRWA Gaza City camp school “A” held a ceremony supporting the stabbings and car rammings. 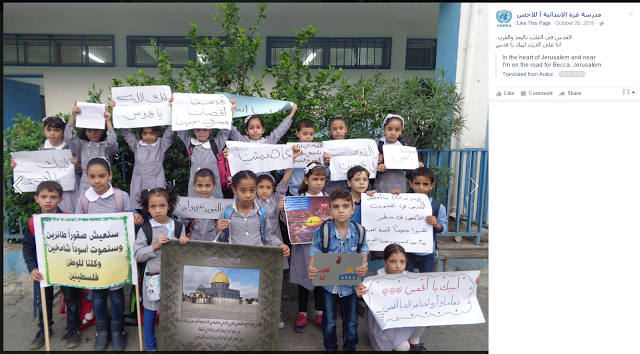 Remember, even though the West characterizes the terror attacks as being prompted by general frustration at the “occupation,” the Palestinian narrative has always been that the terror spree was purely meant to defend the Al Aqsa mosque from Jewish infiltration. The timing of this ceremony was specifically to support the wave of terror that was then reaching its height. This is not UNRWA teachers expressing their support for terror on Facebook, as bad as that is. 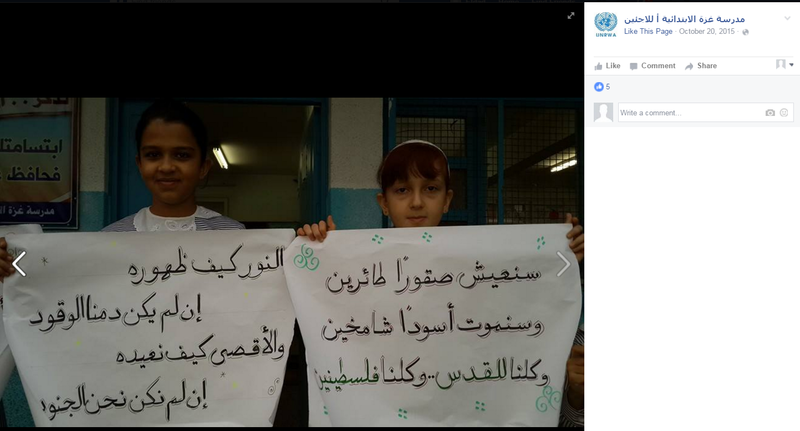 This is UNRWA itself teaching its students to support stabbing Jews – and encouraging them to die in the process. This is beyond disgusting. It is proof positive that despite UNRWA’s denials, its schools are being used as a platform to teach hate and violence. There is no oversight, there are no checks and balances, and the only reason we know about it is because all members of this particular school – principals, teachers and staff – were proud enough of teaching hate that they held a public ceremony celebrating and encouraging terror and putting it on Facebook. 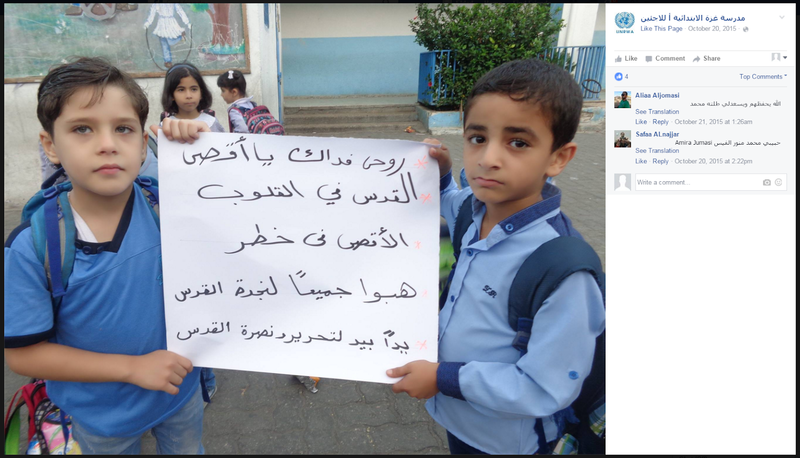 If this is what some UNRWA schools publish publicly, who knows what kinds of hate and antisemitism are being taught behind closed doors? UNRWA pretends that it takes reports about abuses like this seriously. Its commissioner general said this last week, referring to me specifically. 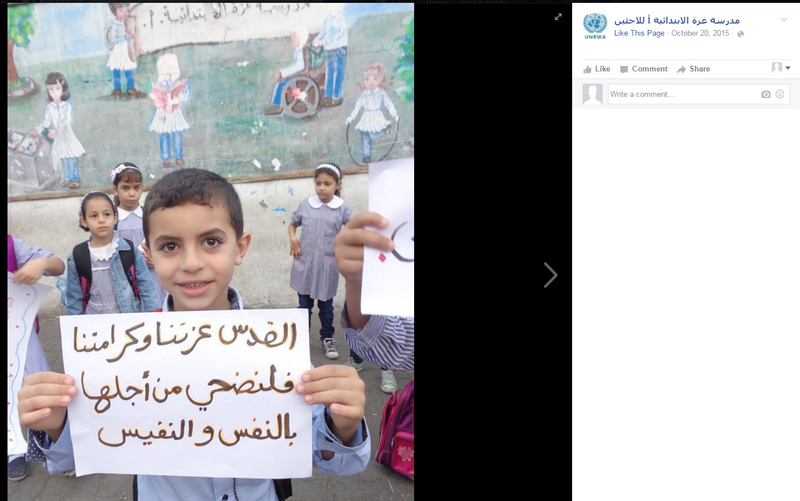 if that is true, then we should expect UNRWA to publicly denounce this ceremony and make a pledge to its donors to take specific, audited steps to ensure that things like this can never recur. But history shows that this will never happen. The pages will be silently removed (I have made copies on public Internet archives) and UNRWA will stay silent. 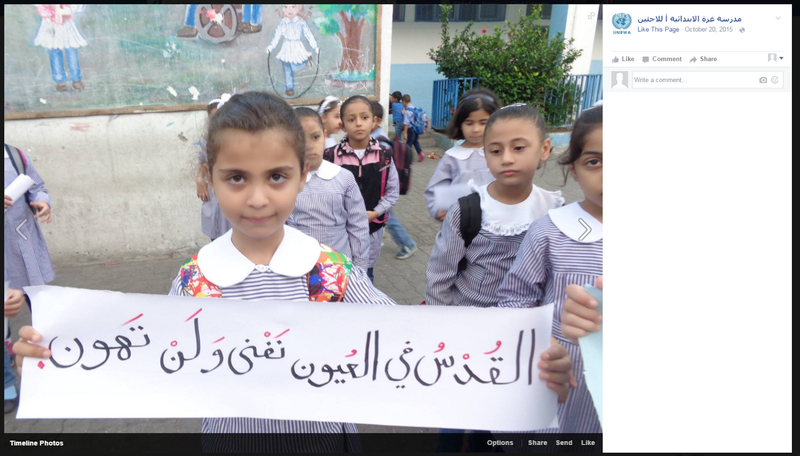 I have already shown institutional antisemitism at UNRWA schools and the organization has simply removed the evidence without admitting any wrongdoing. 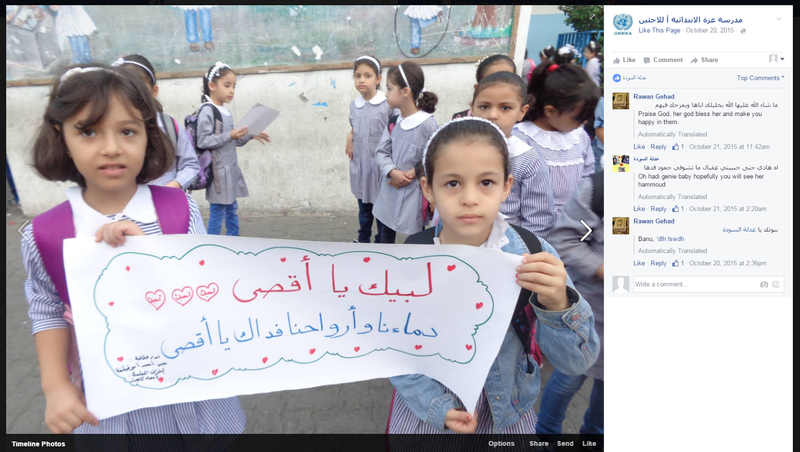 UNRWA head Pierre Krähenbühl might claim to take these reports seriously, but all that means is that he will do everything possible to cover it up. That is, unless the public, the media and the donors demand answers. The pattern is clear. 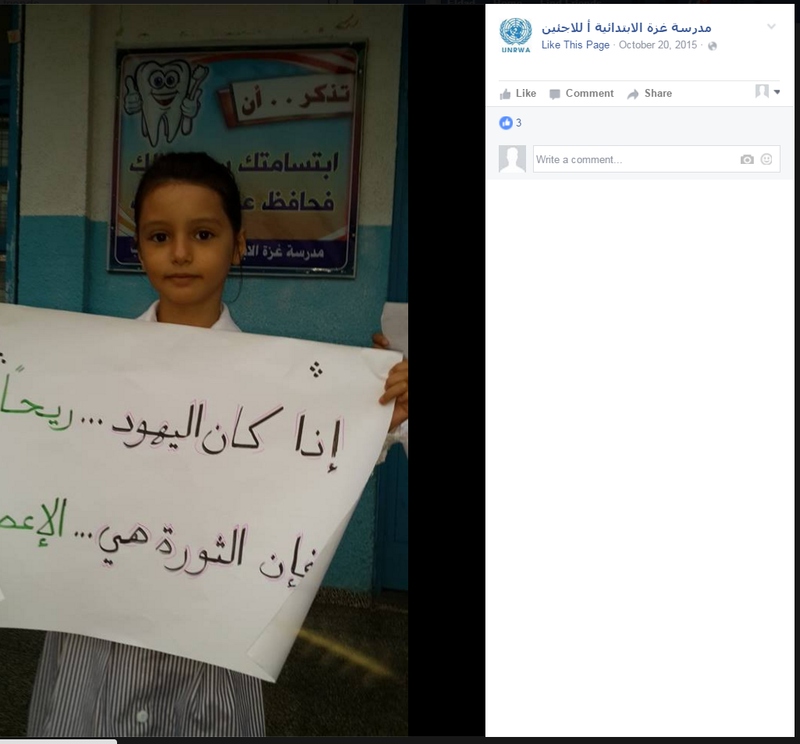 UNRWA employs anti-semites and terror supporters. 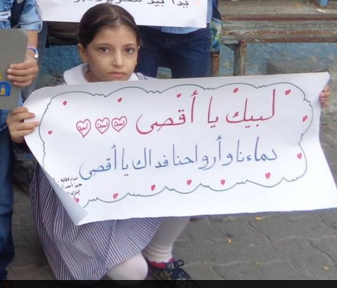 Its schools teach hate. It shows no interest in solving the problem, only in covering them up. 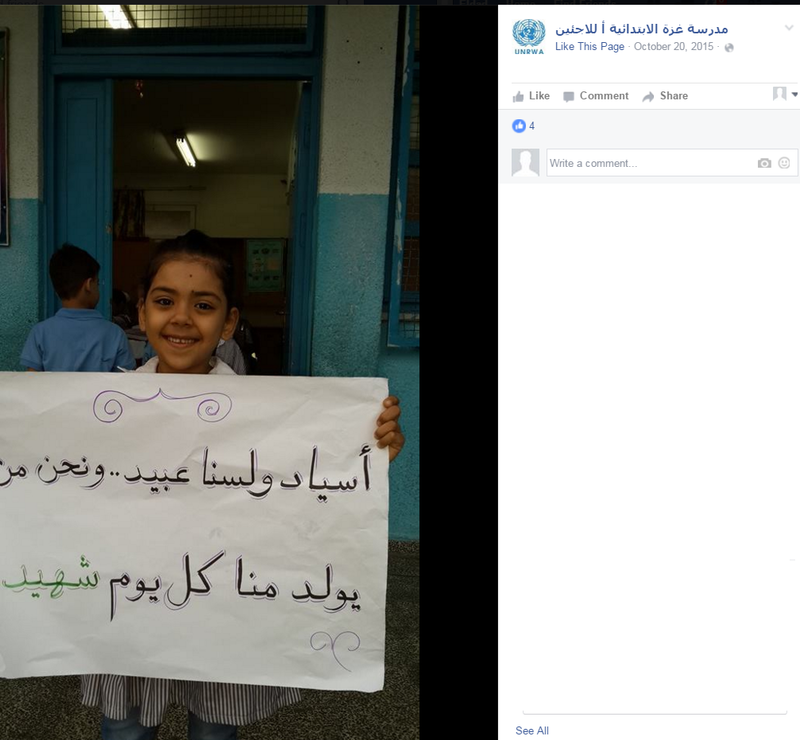 The time has come to demand that UNRWA face consequences for supporting and encouraging its students to commit terror acts. UPDATE: Matt Lee of AP asked the State Department spox to comment. They will check out this story and get back to him. UPDATE 2: This was not an isolated case. UNRWA schools in Lebanon also held ceremonies to support the terror spree at the same time, officially and unofficially.